The Maharashtra assembly on Wednesday revoked the suspension of the five legislators who had allegedly assaulted a policeman on the assembly premises in March this year. Making the announcement, Parliamentary Affairs Minister Harshwardhan Patil informed the House that the suspension was being revoked after a meeting of group leaders of parties and following the recommendations of the committee formed under the chairmanship of senior legislator Ganpatrao Deshmukh to investigate the incident. Members of Legislative Assembly Ram Kadam (Maharashtra Navnirman Sena), Kshitij Thakur (Bahujan Vikas Aghadi), Rajan Salvi (Shiv Sena), Pradeep Jaiswal (Independent) and Jaykumar Raval (Bharatiya Janata Party) were suspended in the budget session of the state legislature after beating up policeman Sachin Suryawanshi in the Vidhan Bhavan premises. The police officer had been beaten up a day after he stopped Thakur's vehicle and imposed a fine for over-speeding on the Bandra-Worli Sea link. An FIR had been registered on March 19 at the Marine Drive police station against Thakur, Kadam and 14 others in this case. The two MLAs had been booked for assaulting, criminal intimidation, rioting etc. 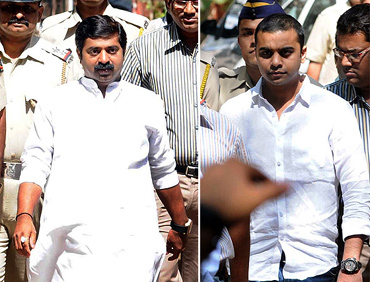 The duo was arrested on March 21, but the court granted them bail on March 25. When the monsoon session of the state legislature began in July, the Opposition had demanded that as the policeman in question has resumed duty, the suspension of the MLAs should also be revoked. Speaker Dilip Walse Patil had then said it was up to the government and the Opposition to take a call.